AKVIS Retoucher - leading solution for photo restoration and automatic scratch and dust removal. Retoucher can be applied to remove dust, scratches, irrelevant objects, unwanted texts and dates from an image. 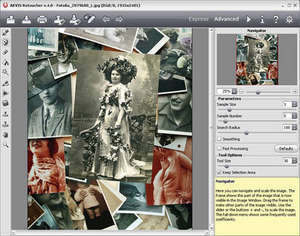 The software is especially useful for restoration of old or damaged photos. The simple interface allows retouching with a mouse click, thereby saving you time and increasing productivity. AKVIS Retoucher 6.0 is a shareware program and can be used as a demo to try the software until the free trial period has ended. A full version of the program is available after the trial period ends. For security reasons, you should also check out the AKVIS Retoucher download at LO4D.com which includes virus and malware tests. Additional screenshots of this application download may be available, too. AKVIS Retoucher has a presence on social networks.